Data grids are used throughout PDQ Inventory. They have a number of customizable features that will help you use and organize data and elements in the software. Data grids are organized into rows and columns. Each column has a number of properties that can be customized. Right-clicking a column header gives you access to many of the features of each grid. •Click and drag the right side (edge) of the column header left or right to make it narrower or wider. •Double-click on the right side (edge) of the column header to make the column fit its widest content. •Right-click the column header and select Best Fit or Best Fit (all columns) to size the column to its widest content. 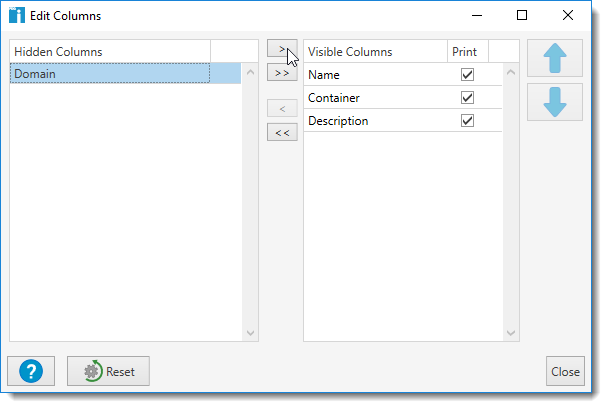 •Click and hold a column header, then drag it to a new location. Blue pulsating arrows indicate where the column will be placed. •Click the Customize this grid button (upper left corner) or right-click a column header and select Edit Columns . In the Edit Columns window, select a column in the Visible Column pane, then click Up or Down. In the Collection Page in Preferences, select a column, then click the Move Up and Move Down buttons . •Click and hold the column header, then drag it out of the grid . •Click the Customize this grid button (upper left corner) or right-click the column header and select Edit Columns (or click View > Edit Columns) . In the Edit Columns window, move the columns left or right to hide or show them. •Click Collection > Customize Collection Page (or Ctrl+Alt+Shift+Z). In the Edit Columns window, move the columns left or right to hide or show them. •Right-click the column header and select Sort Ascending or Sort Descending . •Click the column header to toggle between ascending and descending order. •Shift+click two or more columns. The columns sort in the order clicked. To clear a multi-column sort, right-click a column head, then select Clear Sorting or click any single column head without using Shift+click to return to sorting by one column. 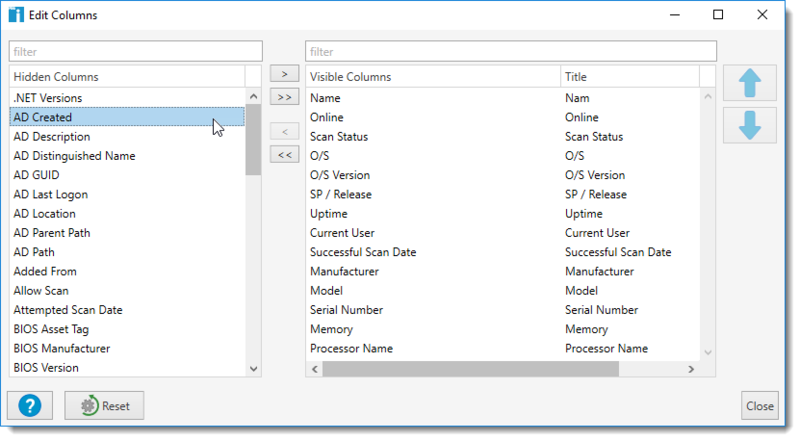 •On the column header of the column you want to filter, click the filter symbol to the right of a column title (appears when mouse hovers over the header), then select a filter value. Only rows with the selected value will display. •Click the filter symbol and select (All). 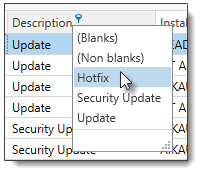 •Right-click the column header and select Clear Filter . •At the bottom of the grid, click Clear Filter or clear the Disable Filter check box. Grouping a data grid allows you to organize rows into a hierarchy potentially making it easier to navigate. With a column grouped, you can selectively view rows based on those groups. •Right-click a column header and select Group by this Column , then right-click and do the same for subsequent columns. •Right-click a column header and select Show Group Panel , then drag columns into the panel. •To see all data, right-click in the group panel and select Full Expand . •To see just the groups, right-click in the group panel and select Full Collapse . •For just one column, right-click a column in the group panel and select Ungroup . 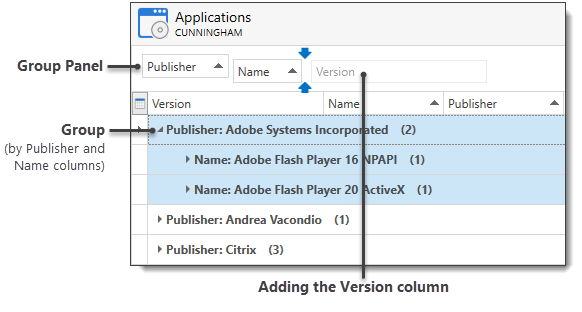 •For just one column, drag the column from the group panel back to the column header. Most grids in PDQ Inventory can be printed. Some are printed by themselves and others are printed as part of other reports. You can specify the columns that do and do not print. Click the Customize this grid button (upper left corner) or right-click the column header and select Edit Columns (or click View > Edit Columns, or click Collections > Customize Collections Page). In both Edit Columns windows, select the Print check box on the columns you want to print. Click the Customize this grid button (upper left corner) or right-click a column header and select Edit Columns (or click View > Edit Columns, or click Collections > Customize Collections Page). In the Edit Columns window, click the Reset button, then click Close. In the Collection Page in Preferences, click the Reset button in the toolbar, then click Close. Any custom settings made to the specific grid you are in are reset to the default settings.